It is finally that glorious time of year when work in the greenhouses begins. Our first cuttings have arrived and we have started potting them up, giving each plant new room to grow in wonderful Vermont Compost Company potting mix. (See note below) We can imagine that they feel the same way we do upon first entering the greenhouse, as they shed their cardboard boxes and we our many winter layers. At first the sunshine pouring down dazzles us, and we squint in the brightness. But soon we are all reveling in the lovely feeling of the rich soil, the moist, 85 degree air on our skin, and the intoxicating scent of rosemary. Within a few days this greenhouse will be filled to bursting with vigorously growing young plants. Note: "Cuttings" are plants that can only be started from rooted stems. Instead of the plant producing seed and being propagated from a seed, plants that are 'vegetatively propagated' (as it is called) are only true to type from the stem cuttings. 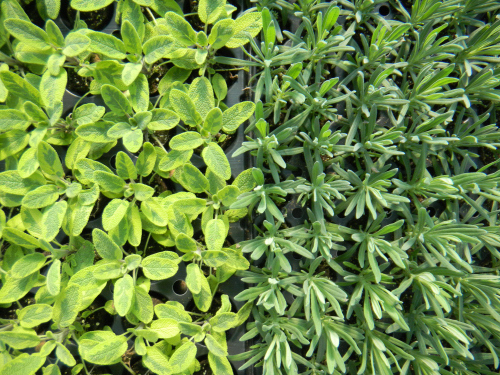 In some cases, this means that they are cloned hybrids - a cross between two plants and they would revert back to looking like one of their parents if you planted the seed. Another reason plants are propagated this way is because they are too slow to germinate and in our climate, they would be hard to establish. We buy in our rooted cuttings because making them ourselves would require heating a greenhouse all winter long and for now it is more efficient to buy in these beautiful cuttings from growers in Quebec and Massachusetts who specialize in this kind of greenhouse production. And just to be clear, this is old-fashioned plant breeding and propagating - these are not test tube babies or genetically modified organisms. It might be 5 below, but we've got plants to grow! 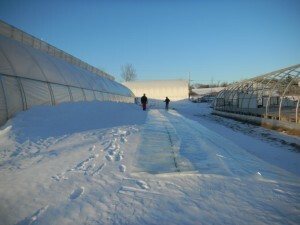 We put new plastic on our third greenhouse last Wednesday, a cold, but beautifully sunny morning. Eric tying a tennis ball into the plastic (to hold the rope without tearing). We are busy preparing for the 2011 season and this includes counting everything in sight such as seeds, pots, trays, tags, and signs as well as ordering seeds, cutttings, pots, trays, tags, soil, and anything else we may need to make everything tick. But the most exciting preparation is the new grading and gravel in the greenhouses. When we first built the greenhouses 6 years ago, we had to cut some corners (that money thing, you know) and it meant that we did not spread and compact gravel before building the greenhouses. Well, over time, the native clay sunk and became a wet, weedy mess which unfortunately can harbor pathogens and pests. This fall, Linda Gionti of Gionti Stone Works, and Parker Excavation have been working together to bring us brand new, beautiful gravel floors which we are covering with brand new landscape fabric. This will keep weeds down and create a clean surface that can be swept and kept clean. It feels just great to have such team work (thanks to Eric, Jonathan, Allison and Buddy) hauling everything out of the houses and then setting it all back up again. Here are a few photos to give you a taste of the job. It's kind of like getting a spa treatment for the buildings. We are busy happily working in the greenhouses! Early spring is an active time for seed planting. Some vegetables need to be planted in a greenhouse and nurtured along as the Vermont summer is just not long enough for them to be planted directly in the garden. The germination of the earliest vegetables is a thrill to us and we know that they will thrill you in your gardens. With a few simple strategies for season extension, Spring can be a rewarding time to see a few early flowers and even to grow some cold tolerant greens. Containers are a great way to do this. They can be kept indoors on the coldest days and nights, covered up with row covers, blankets or plastic sheeting on the mildly cold nights, and left out all day and night once the weather permits. Any crate, or large pot with holes in the bottom can be filled with good quality potting soil such as Vermont Compost Company?s “Fort V” and then planted with an array of salad greens and edible blossoms such as pansies that you can cut from once they reach a few inches high. You can cut and harvest these plants and allow them to re-grow for multiple harvests, allowing you a gorgeous salad while it is still too cold to be out in the garden. As soon as the soil can be worked in your garden, it is possible to get a jump on our seemingly late warm weather by building a simple shelter out of Number 9 gauge wire and some row cover or even old blankets and plastic sheeting. If you cut the wire into 6 foot lengths, plant each end into the ground (making a hoop) and repeat every few feet, you now have a very quick and easy tunnel frame upon which to drape your fabric. This creates a lovely shelter for some very hardy greens. With this type of simple tunnel, a version of a cold frame, it is most important to cover it at night and uncover it in the morning. The plants can get very hot unless you use special row cover designed to stay on night and day. The most cold tolerant food crops we can grow here are things like kale, spinach, collards, arugula, mustard greens, mache (corn salad), and many herbs such as cilantro, dill, sorrel, and chives. Certain lettuces are very cold hardy, but they cannot take the frost quite as well as the plants mentioned above--good cold hardy varieties include the French heirlooms, “Reines des Glaces” and “Merveiles des Quatres Saisons.” These most tender and delicate looking lettuces can take quite a beating when it comes to cold weather. Overall, early spring is a great time to satisfy the need for green, fresh foods that are grown locally after a long winer of leafy foods trucked in from far away. The difference in taste and the level of satisfaction you will experience is well worth the effort.